Today's cars are widely fitted out with alloy, spoked wheels that are largely a styling exercise. Our older cars utilized what we called "stamped steel" wheels. Actually, these wheels are technically called "drop center, steel disc-type wheels." If you look at one of these wheels you will notice that it's made in two sections. The outer part forms the rim, while the center, dropped, section (called the "spider") is riveted or spot-welded to the rim. The center section, of course, has the holes for the wheel lugs and center hub. Looking at a wheel in cross-section, there are several distinct components. At the outer edge is the flange, which holds the tire bead in place and acts as a good attaching point for wheel weights. Inside that area is the tire bead area, a flat portion on which the tire's inner bead rests. 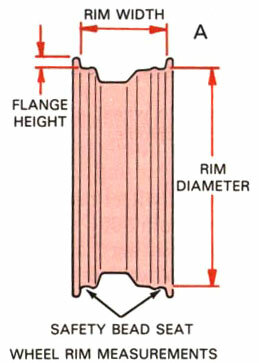 The center area is the dropped portion, and this is designed so that the tire's bead can "drop" into that area to allow the opposing bead to be stretched over the rim. Wheels must be manufactured to relatively close tolerances. Otherwise, they will run out of "true" and cause handling and tire wear problems. Runout (out of plane) on wheels of the 50s and 60s shouldn't be greater than 1/16th inch. They must also be airtight and free of major rust. Front wheels (rear wheel drive cars) revolve about the steering knuckle spindle on ball or tapered roller bearings. A nut and cotter pin on the end of the spindle hold the bearing to the proper "loaded" compression and, of course, prevents the bearing from working its way out. 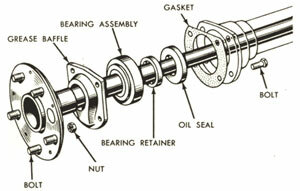 A safety washer is placed between the bearing and the nut. It has a metal tab that sits in a groove cut in the spindle. This tab prevents the washer from spinning with the bearing. Older, drum brake-equipped, front hubs use a stringy, fibrous wheel bearing grease that has the property to adhere to the bearing surfaces even while friction heats things up. Later, disc brake-equipped, front hubs use a higher temperature grease for the bearings due to the greater overall temperatures such brake systems create. 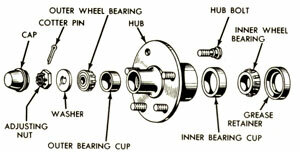 Typical rear hub and bearings. Rear hubs are almost always integral with the rear axles. They are splined at the differential end to mate with the differential gears. At the outer (wheel) ends there is an outer roller bearing that is pressed onto the axle shaft. This roller bearing sits in the rear axle housing and is sealed from outside moisture and dirt. Wheels are bolted directly to the rear hubs. In order to operate smoothly, it is essential that tires and wheels be properly balanced. Assuming the wheels, hubs and axles are within proper tolerances, these components will tend to rotate without creating more than minimal vibration. Tires, on the other hand, can easily be out of round or slightly heavier in some areas, causing lots of problems due to unbalance. Tires and wheels have to be balanced as a set so that any irregularities in one will offset those in the other. Any unbalance has to be taken out with the selective use of weights to prevent wheel tramp and wheel shimmy. Wheel Tramp is defined as the wheel hopping up and down. Wheel Shimmy is defined as the wheel shaking from side to side. To prevent both tramp and shimmy, tires and wheels must be both STATIC and DYNAMIC balanced. When a tire/wheel is in proper Static balance the weight mass will be evenly distributed around the axis of rotation. Therefore, if a wheel is raised from the floor and spun several times and always stops in a different place, it is statically balanced. If it stops in the same place each time it is not statically balanced. Static unbalance is solved by clipping weights to the rim edge opposite to the heavy side. Dynamic balance is defined as the center line of the weight mass being in the same plane as the center line of the wheel (think "wobble" here.) In wheels that are not dynamically balanced, as the wheel revolves the weight masses will reverse their positions. Each half of the wheel, therefore, struggles as it passes through the center line of the wheel, causing the wheel to wobble. If the dynamic balance of a wheel/tire assembly is correctable, it is done by adding lead weights to both sides of the rim until the weight masses are equal all around. "Correctable" is a bit of a conundrum, however, since there is a practical limit to how much weight should be added. Generally speaking, if more than about 6 ounces of weights are required to get the dynamic balance into tolerance it is better to replace the tire or wheel.